Last Saturday, we spent the day at my grandmother’s house. The weather was pretty hot so we though it be a good opportunity to take the dogs out and get out of the house for a change. Haru woke up pretty early and in somewhat of a bad mood. Normally, she’d wake up at around 6am and play around in her crib for a while until she got bored. Then she’d yell for one of use to pick her up and take her down to the living room. But this time she woke up a bit earlier than usual, and demanded that she be taken out of her crib immediately. Both of us being tired and sleepy, our reponse time was admittedly pretty slow, which only served to escalate Haru’s impatience. I eventually got up and tended to her. But instead of taking her downstairs to the living room, I placed her on our bed in the hopes that maybe she’d fall asleep and leave us alone. No chance! Instead she crawled all over the bed, grabbing onto anything (or in many cases anyone) that would help her stand up and jump on the bed. I eventually got annoyed by the early morning rampage and sidelined her play time by putting her onher back, which didn’t make her too happy, and sent her into full fledge tantrum mode. It soon became clear to me that she wasn’t going to let me sleep in on my longly awaited Saturday morning. After our rude awakening, we all eventually got out of bed and Haru was fed tended to. Before the weather got too hot, I trimmed the branches on the trees in the front yard, because they were dropping little rasberry-like fruits all over the street in front of the house as well as the neighbor’s driveway. After the quick yard work and Haru’s breakfast, we decided to pack up the dogs and head to my grandmother’s house in Tokyo. The ride was uneventful. We strapped Haru into her red Recaro baby seat, and she fell asleep a few minutes into the trip, so it made for a nice peaceful drive. When we arrived, we let the dogs do their thing outside, and then headed inside. Unlike the previous week, Haru seemed to be a bit more relaxed and confortable with the surroundings. She didn’t cry as much when someone she didn’t know held her. She even managed to get in a nice long one hour nap. For most of the afternoon, Haru seemed to be into everything. Along with constantly wanting to stand up and cruise around, she also wanted to touch everything. And of course, whatever babies touch has to tasted too, so she’d also put things in her mouth as well. He activeness earned her a new nickname amongst my relatives. They call her O-Mame-chan in reference to how active she is. I wasn’t too sure what this meant; all I know is that the word mame means beans. There’s even a product called Fujikko no Omamesan which is processed beans. So my wife and I assumed that it meant that since Haru is always into something or on the move, that she’s like scattering beans. Later that evening, we all went out for dinner. Unfortunately, Haru still doesn’t do too well at restaurants. I think that the noise and the people are still a bit over stimulating for her. But luckily, she was so overwhelmed that I managed to get her to sleep pretty quickly. Strapped in ready to go. Haruka is now an official Yokohama city resident. We went down to the city office today, and registered her. Her official name is “Hayashi, Haruka Victoria”. I was a bit concerned about the way they would handle her western name. I have heard stories of how the Japanese government offices butcher western names because they are not used to processing them. They’ve successly butchered up my name so badly, that I had to change it . Otherwise I would be cursed with having to sign four different names to every single official document. Hopefully, Haruka won’t be cursed with having to do this as well. Haruka has been suffering from constipation. She hasn’t gone in over a day now and we are bit concerned. This causes her to wake up every couple of hours and cry continuously for several minutes. Today, we went to the grocery store to buy some prune extract. I basically mix this with warm water and let her drink it after her bath. It hasn’t worked yet but hopefully it does soon. I personally blame her constipation on the baby formula given to us by the hospital. Its absolutely worthless and full of junk. I wouldn’t use it if I had the choice, but unfortunately my wife is unable to produce enough milk to keep up with Haruka’s appetite. But this is improving on a daily basis. The other day, I bought some knitted caps for Haruka. She has very thin fine hair that sticks straight up, so she looks like a baby orangutan with male patterned baldness. The caps arrived today and so I tried putting it on her head. She looked really cute with it on, but I think it’s maybe a bit too early for her to wear it. Perhaps in another couple of weeks or so when the bones in her head has hardened a bit more. I personally take names pretty seriously, because its something that one has to live with for the rest of their lives. Therefore in my opinion, choosing a “trendy” or really unusual or uncommon name is not a good idea. A good example of this, are those people who gave their children “hippy” names like “Moon Flower” (or whatever) during the sixties. May have sounded cool back then, but nowadays it would be a person with a really outdated and even somewhat embarassing name. My generation isn’t without its weirdos. In Japan, there has been a recent trend to give really unusual names to children. Some people choose to give their kids western “sounding” names (emphasis on the word sounding ), when in reality there’s no such name. Just a bunch of phonetic alphabets stuck together to make a non-Japanese word. Some people want to give their children names with extraordinarily difficult Kanji (Chinese) charaters, that no one knows how to write. My cousin did this with both of his sons. To me, this is really dumb! I would rather keep things fairly simple so that the child is able to read and write their own name (with certainty) by the time they are in grade school or earlier. With newer generations of kids seemingly getting dumber and dumber, I have a feeling that we are going to have a whole generation of kids who cannot write their own names, even when they become adults, which is really sad. Another trend is to give children names of old Anime (Japanese cartoons) characters. Again dumb! Really DUMB! This is worse than giving children hippy names, because now the child will always be a associated with a cartoon character. My cousin and my brother in law did this, which is just plain silly. 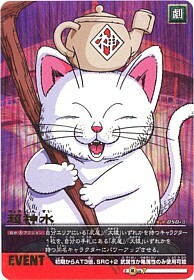 My cousin named his little girl “Karin” after a cat that appears in the popular 80’s anime series Dragon Ball. My brother in law chose to name one of his sons “Tsubasa” from Captain Tsubasa, which was another popular 80’s anime series. However, I am probably more prone to accept this because Tsubasa is a real proper boy’s name. So naming a boy after another boy (even if he is a anime character) is okay, but naming a girl after a talking cat isn’t okay, in my opinion. We’re coming down to the end of the 3rd week. So far, nothing too specatular to report, other than Baby Plus is REALLY annoying! The rhythms are really fast now so its not as boring as it was during the first week. This means that its harder to ignore or sleep through. It’s like having a drum machine in the room, but not quite as loud. The baby does seem to respond to it though. She moves quite a bit more compared to times when it’s not on, but again this could be sheer coincidence. The reason why I say this, because my wife says that she (the baby) is very active throughout the day. So coincidently, “Baby Plus time” could just be the time of day she chooses to be the most active. Lesson 4 will start in a couple of days, so we’ll see if she responds any differently. Although she won’t admit it, my wife and I really wanted a girl. So learning that IT is a SHE makes us both pretty happy. Growing up in a generation with nothing but boys in our family was probably a bit boring for everyone. My uncle eventually did have a girl, but it wasn’t until we were all teenagers. So having a couple of girls (our child) and my cousin’s new baby, may bring a bit of spice into the family. The only thing about having a girl that may not be interesting is not having someone to do “guy things” with, like working on cars or playing sports for example. But having said that, I was never too much into playing sports, so I don’t think I would have been too good at playing ball or whatever typical father-son activities there may be. I’ve always been into artsy things like theater arts, pencil sketching, so in that sense, it’s probably a good thing. Naming our child has at times been a very sensitive issue for my wife and me. There were a couple of occassions when the discussion escalated into argument. But in the end, we were able to sit down and discuss it out rationally. I ultimately had to sacrafice my first choice for a Western girl’s name, which was “Rebecca”. There was no logical reason why I chose this name other than I thought it sounded cool. But I figured that no one would call her “Rebecca” and rather call her “Becky” which is a name of a very popular TV talent here in Japan. And although Becky is a cute name, people may think I named her after the talent, so maybe it was a good idea to axe that name. Conversely, my wife chose a Japanese boy’s name that just didn’t sound like something I would want to call our child for the rest of his life. By the way, the name was “Tohma” which is really unusual, even in Japan. I made it clear in the beginning that we weren’t giving our child any unusual or uncommon names with complex Chinese characters that they won’t be able to write until they are in high school, because it just complicates things for everyone. But of course, that doesn’t mean that the name has to be boring. Ultimately, we made a list of a few names (both Western and Japanese) that we both liked and agreed on. For the Japanese girl’s name, we wanted to maintain our family tradition and use the “é¦™” character (which means frangance) somewhere in the name. I always liked the name Haruka, written æ˜¥é¦™, which means the fragrance of spring. It’s a fairly common girl’s name, yet not boring, and it the Chinese characters are simple enough for a grade school child to write. So this name was decided pretty early on. I didn’t want something that sounded like a child’s name, because eventually she will be an adult. At the same time I didn’t wnat something that was too mature sounding. And of course, being in Japan, it has to be something that is somewhat common otherwise she will be questioned all her life on how to pronounce her name. With Japanese linguisitics being so low resolution, Japanese people tend really bastardize and mispronounce Western names. Marisol is more of a Latin name, so Japanese people would most likely pronounce it closer to its original Latin pronounciation, which would be good. The bad part is that people might just call her Mari, which is already a Japanese name and would defeat the purpose of giving her a contrasting western name. I personally wanted something a bit more European sounding, so we pretty much decided that Victoria is the winner. Thanks to Victoria Beckham aka Posh Spice (whom I really dislike), the name “Victoria” has grown quite known in Japan, so no one will question how to pronounce it. And as a child, we can call her either Vicki or Tori, which are common nicknames for Victoria, and equally easy to use in Japan. We never got to decide on a good western boy’s name. I really like the name “William” but can’t stand “Bill” or “Will”. But we were throwing around the name “Aiden” for a while. It’s fairly common but not obnoxiously overused like John or Michael. And the Japanese name would have been “Yuhki” pronounced yoo’ kie , written “æ‚ è²´â€which I admit would have been a really cool name if he were a boy.